1.Preheat oven to 450°; sprinkle turkey with 1/4 teaspoon each salt and pepper. In oven-safe large skillet or roasting pan, heat oil over medium-high heat. Add turkey and sear 2 minutes per side or until outside is browned. 2.Transfer skillet with turkey to oven; roast 25 minutes or until internal temperature reaches 160°. Transfer turkey to cutting board; loosely cover with aluminum foil and let stand 10 minutes (internal temperature will rise 5 to 10° upon standing). 3.In medium saucepot, cook cranberries, vinegar and honey over medium heat 5 minutes or until some cranberries pop, stirring occasionally. 4.In same large skillet, melt butter over medium heat. Add shallots and rosemary; cook 3 minutes or until shallots begin to soften, stirring occasionally. Increase heat to high; add broth and heat to a boil. Boil 5 minutes or until slightly reduced, scraping bottom of skillet with wooden spoon to loosen any browned bits; reduce heat to medium. Stir in cranberry mixture and remaining 1/2 teaspoon salt; cook 5 minutes or until thickened slightly. Makes about 1-1/2 cups. 5.Slice turkey and serve with sauce. 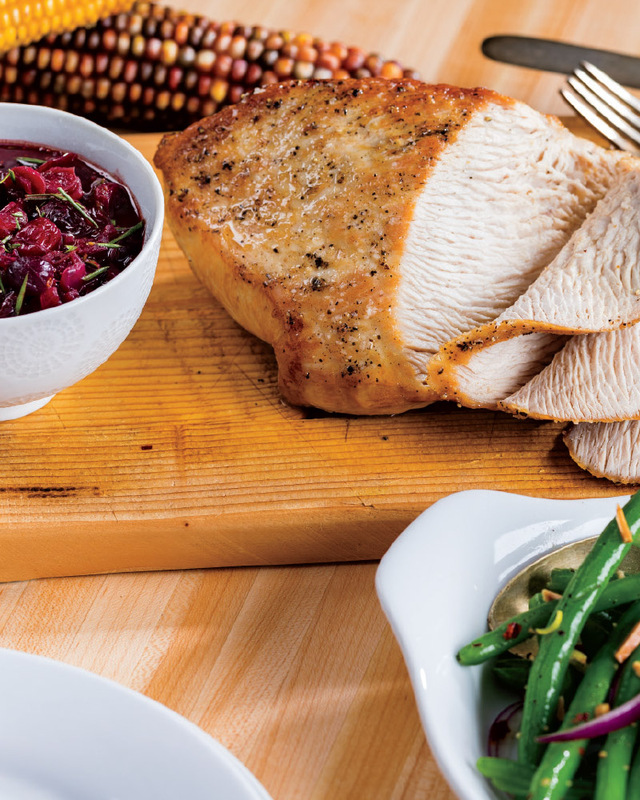 > This delicious cranberry sauce is not just for the Thanksgiving turkey. Pair it with a pork loin, use as a spread on turkey sandwiches or as a topping for baked brie.